So this is one of the best things I've made in a long time (canning aside, since I can't assess that until it's lived in its glass for a while). The husband brought home swordfish tonight, two beautiful triangular pieces of fish that he said looked excellent in the store. With half a loaf of ciabatta bread that was getting a little old, I made garlic bread. Approximately equal parts butter and olive oil, with Johnny's Garlic Salt and fresh ground pepper to taste, drizzled onto halved-lengthwise bread in a 300-degree oven wrapped in foil. It was baked while everything else was cooking (I boosted that to 400 about 10 minutes before service, but I should have done it sooner to get more crispiness). In a small saucepan, I sauteed pressed garlic in a few teaspoons so each of olive oil and lime juice until the garlic was fragrant and just beginning to color, then added a third cup of pureed heirloom tomatoes, and a tablespoon or so of whipping cream. I let that simmer while I prepared the fish, then about halfway through cooking I added another about two cups of the tomatoes, pureed with two stalks of thyme (the leaves stripped from the stalks, stalks discarded). In the meantime, I sniffed my spice cabinet. I sniffed all manner of spices, and rejected most of them. What I added to a flattened bowl was ground red pepper, ground cinnamon, ground smoked paprika, fresh ground rose pepper, and fresh ground Hawaiian black salt. I coated both sides of the swordfish in that. I had heated a tablespoon or two of Persian Lime olive oil that we got as a wedding gift (thank you, Gayle and Bob! this was a wonderful first use of it), on medium-high heat in a nonstick fry pan. A very small red onion, not quite a scallion, was sliced thinly and sauteed with a little salt and pepper in the lime olive oil until it was nearly crispy, then the onion bits were removed. The coated swordfish went in the pan with the lime olive oil, and I seared it, flipping the fish three times so each side got two chances in the pan. That wasn't so much intentional as necessary because I wasn't paying attention (the Giant Block of Cheese episode of The West Wing was on, and the Peters projection map distracted me). 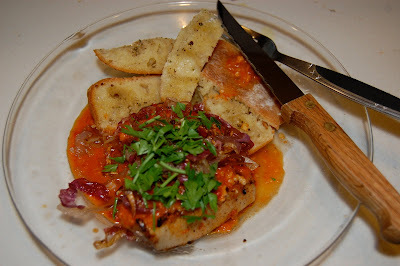 To build the plate, I added pieces of garlic bread and the fish, then topped the fish with the tomato sauce, the crispy-ish onions and a sprinkling of freshly chopped Italian parsley. Honestly, I'm not much for traditional garnishes. No sprigs of parsley looking pretty next to fish for me. But I follow my instincts, and the plants on my porch told my instincts to go for the parsley. They were right. The parsley was a beautifully fresh flavor on top of the fresh tomatoes, and mixed with the lime juice in the tomato sauce and the lime oil with the fish and onions was really, if I say so myself, perfect.